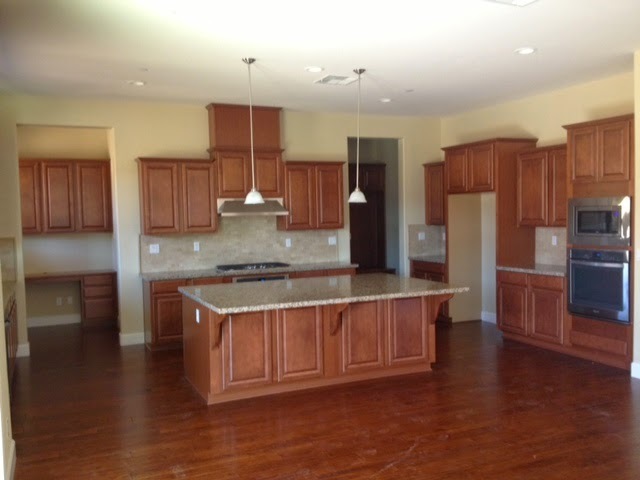 We were invited to the Brokers Open House for The Pinnacle at Serrano, built by Toll Brothers. 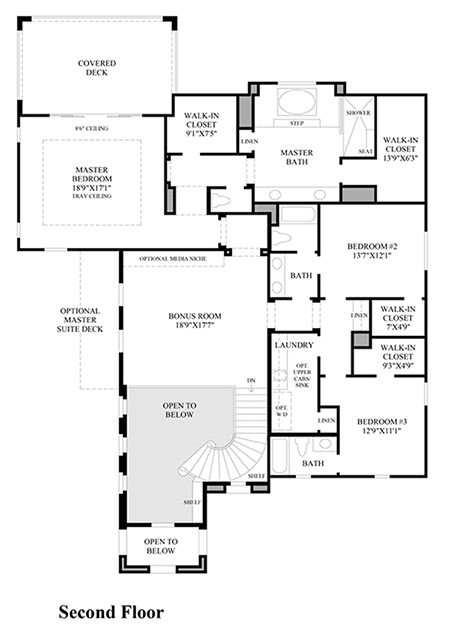 The models will not be completed until May 2015, but the floor plans were released. 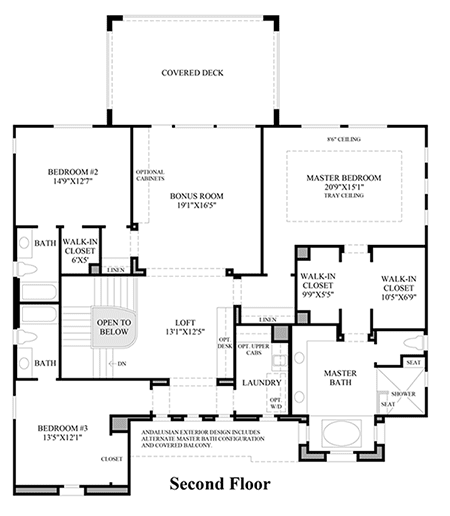 There are 3 two-story floor plans and 1 single story. They have a handful of golf course lots and lots with golf course views. As of yesterday, three lots have been reserved. My personal favorite lot is still available, #118. It is located on the 15th green of the Serrano Golf Course. Another wonderful lot would be #201. It has golf course views because it is situated much higher than the Taylor Morrison homes that will be built underneath. 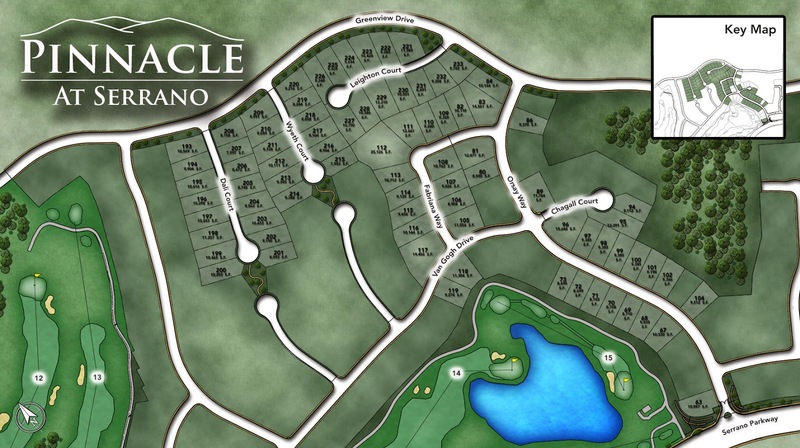 The Venosa floorplan flipped with the courtyard facing the golf course would be wonderful on #201. Prices are starting in the low $700k's. 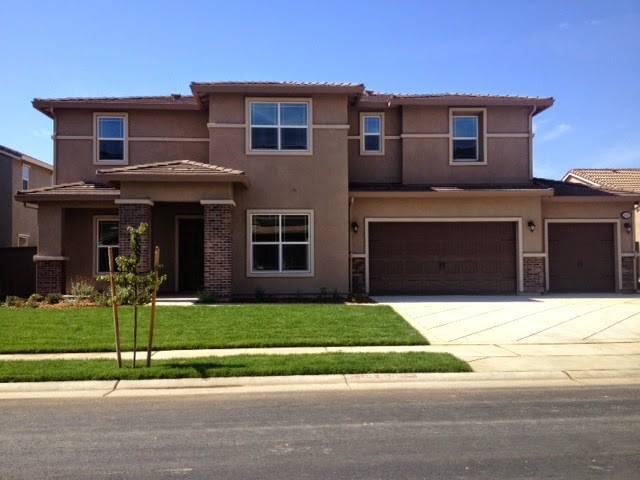 If you are interested in one of these homes, give us a call at (916) 289-9866. We are preferred agents and have gift cards for our clients that are worth $1,000 in options. As I have mentioned in past blogs, when purchasing a new home, realtor commission's do not effect your purchase price. In fact, it helps because we negotiate! Realtors are paid a marketing fee which is from a completely different branch of the company. What we loved about these homes was that they are semi-custom. The buyer picks the lot, the floor plan, the finishes and the exterior elevation. 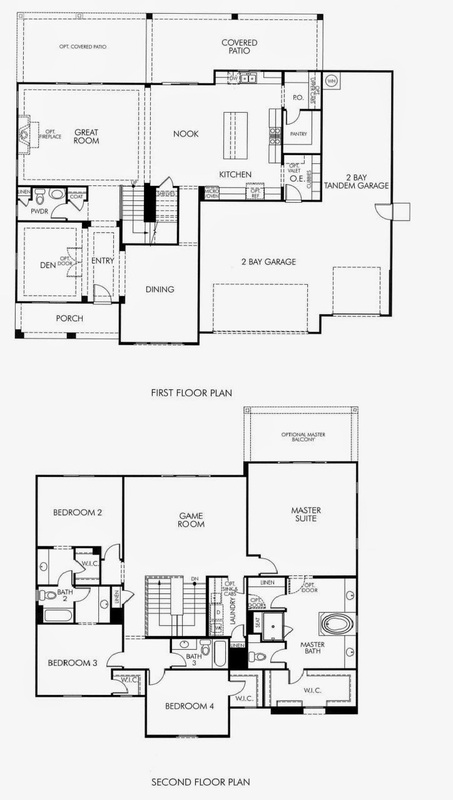 They also have the option of modifying the floor plan. Common modifications have been wine cellar instead of the planning center, garage configurations, first floor master bedrooms, etc. 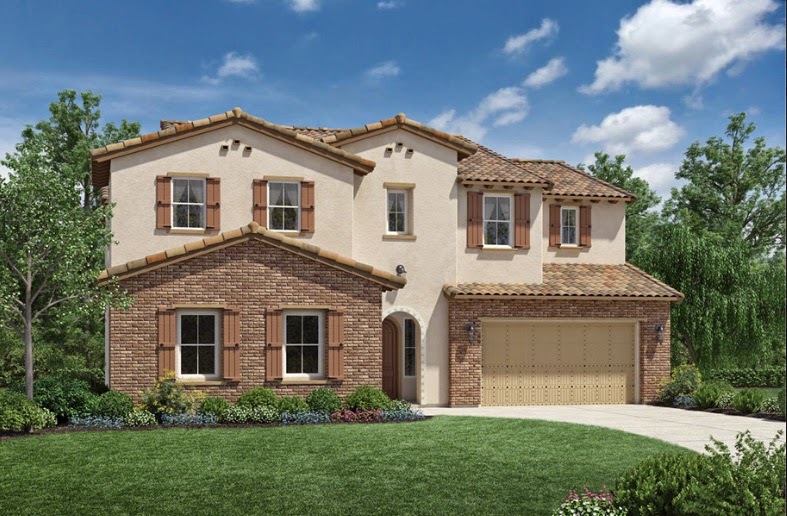 An option we thought would be a good investment would be a third car garage on the Palermo single story model. 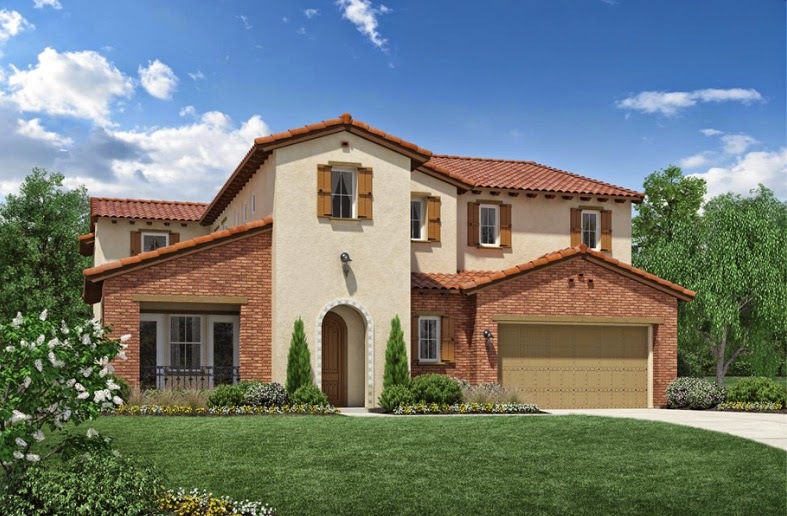 Parking can be an issue in Serrano and for resale, a three car garage is a must!! 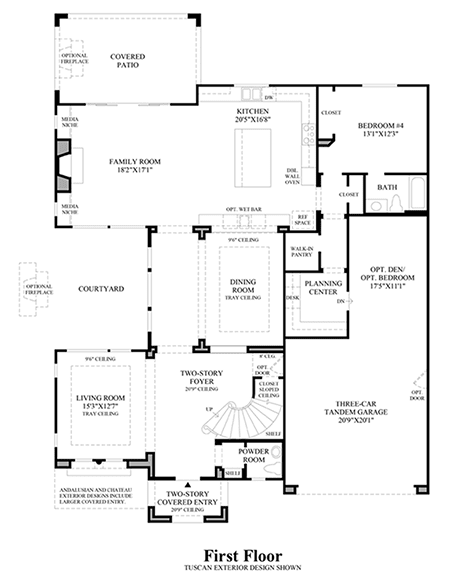 There are three different elevations for each of the floor plans; Andalusian, Chateau and Tuscan. The attractive courtyard entry adds curb appeal and leads to the welcoming foyer which flaunts an elegant tray ceiling. A bright and open floor plan unifies the main living spaces creating an ideal environment for entertaining. The expansive great room offers abundant space, direct access to the sizable rear covered patio through a stunning sliding door system, and a marvelous fireplace that is surrounded by exquisite niches. This fabulous kitchen includes a large center island with a breakfast bar, an adjoining breakfast area, an accommodating walk-in pantry, and discreet access to the formal dining room through a convenient butler pantry. The spectacular dining room is highlighted by a beautiful tray ceiling and offers a considerable amount of space for hosting even the largest of dinner parties. The impressive master bedroom is accentuated by a tasteful tray ceiling and includes an elaborate sliding door system to the rear yard, a large walk-in closet, and a gorgeous master bath which includes a private water closet, a dual-sink vanity, a grand soaking tub, and a luxurious shower with a drying area and seat. Additional highlights include a desirable den, a sizable laundry, and generous secondary bedrooms that offer walk-in closets. The inviting covered entry opens up to soaring ceiling heights in the two-story foyer which draws attention to the graceful curved staircase. The appealing living room is accentuated by an exquisite tray ceiling and a beautiful bank of windows that allows for natural light to fill the room. The formal dining room incorporates an elegant tray ceiling and is located off the main hall which includes views of the intimate courtyard. The impressive kitchen features a huge center island with breakfast bar and is open to the generous family room which is completed with a desirable fireplace that is flanked by accommodating media niches. 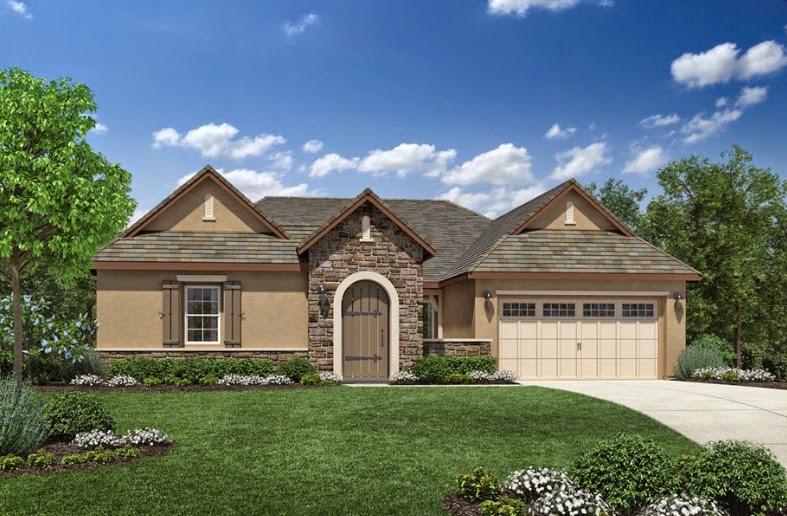 The welcoming bonus room creates an additional living space that is centrally located to the bedrooms and is perfect for multi-generational entertaining. The mesmerizing master bedroom is highlighted by a dramatic tray ceiling, a sizable private deck, two walk-in closets, and an extravagant master bath which offers a dual-sink vanity, a private water closet, a gorgeous soaking tub, and a luxurious shower with seat. The delightful courtyard entry welcomes guests as they enter the elegant foyer which proudly displays a beautiful tray ceiling and a grand staircase. An expansive great room offers plenty of space for entertaining, a cozy fireplace, and a fantastic bank of windows that opens the space to the generous rear covered patio. This inspiring kitchen features an impressive center island with a wrap-around breakfast bar, abundant counter space, a walk-in pantry, and an adjoining dining room. 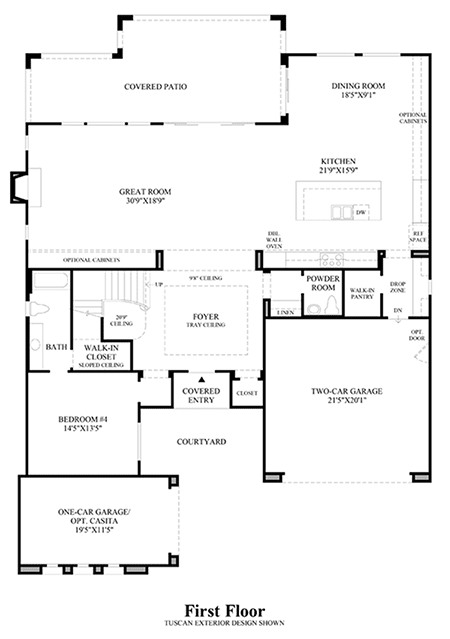 A well-designed second floor provides an appealing loft space, a spacious bonus room, and a huge covered deck that maximizes outdoor entertaining. The sensational master bedroom is completed with a tasteful tray ceiling, two walk-in closets, and a marvelous master bath including a dual-sink vanity, a luxurious shower, and a desirable soaking tub. The picturesque covered entry opens up to an inviting foyer with an ornate curved staircase that defines a graceful double-volume space. The expansive great room is open to the kitchen and dining room while offering abundant space, a cozy fireplace, and access to the generous covered patio through an elaborate sliding door system. The well designed kitchen features a large walk-in pantry, plenty of cabinet space, and a huge center island with a supplemental eating bar for informal dining. The formal dining room is highlighted by a sensational bank of windows and is large enough for even the largest of family gatherings. 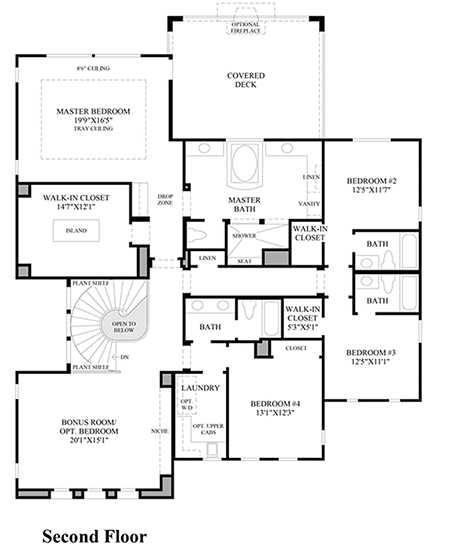 The stunning master suite is accentuated by a beautiful tray ceiling and incorporates a well-proportioned walk-in closet, a huge covered deck, and a marvelous master bath offering dual vanities, a private water closet, a large soaking tub, and a luxurious shower with built-in seat. Additional highlights include a spacious bonus room on the second floor, a convenient planning center, and an appealing first-floor bedroom that is complete with a walk-in closet and private bath. 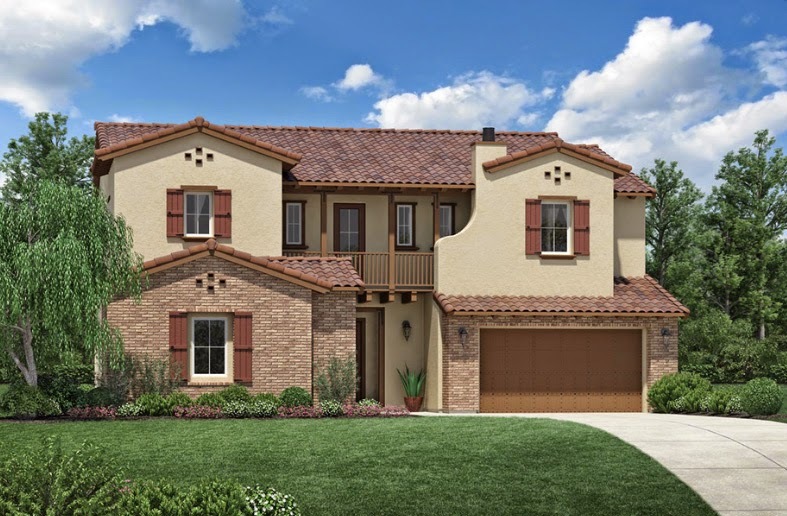 If you are looking for a good deal on a larger home (3,806 sf) look at the new Meritage homes. There are currently two of the same model, the Mitchell, that are move in ready. 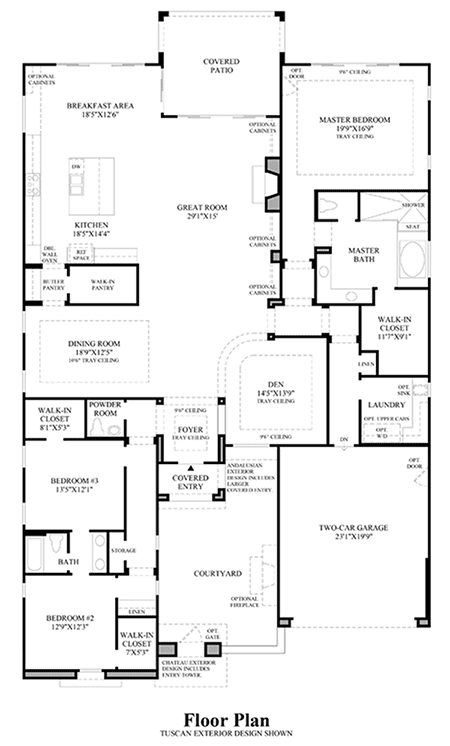 This floor plan is not modeled, if you would like to view it call (916) 289-9866 or email Stephani.Menser@cbnorcal.com. Both homes offer VERY large lots in comparison to other homes in the area. The home pictured is located on lot 628, on over a 12,000 sf lot. The modern home with a great room concept, is perfect for entertaining large parties or intimate gatherings. The first story with wood floors throughout offers a home work area off the kitchen, a mud room, formal dining room and an office. 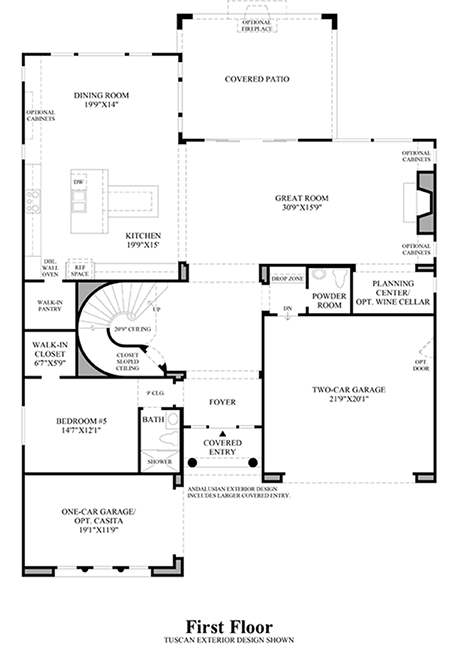 Upstairs are the 4 spacious bedrooms, 3.5 bathrooms, expansive loft area, and laundry room connected to master bedroom closet. The kitchen is a chefs dream, with a large island, kitchen sink overlooking the backyard, maple cognac cabinets, granite counters, a tasteful backsplash, stainless steel appliances and brushed nickel fixtures. This home also offers a 4 car garage!!! Since the home is move in ready, the builder needs it sold. It is listed at $672,300 but since they completed the construction, they are offering $35,000 OFF the price. The in office sales associate for Meritage informed me that they will give our clients a washer/dryer/refrigerator and blinds!Also, if you use their in-house lender, they offer an additional $10,000 credit towards closing costs. This is a good deal for such a beautiful, energy efficient home!